Former Wisconsin Badger Blake Geoffrion scored his first NHL goal with the Nashville Predators this week. Geoffrion’s Wisconsin Badgers lost 5-0 to the Eagles of Boston College last season in the Frozen Four. But it wasn’t all bad. Geoffrion became the first Badgers player to win the Hobey Baker and only the 10th Wisconsin player to be named a finalist. In his college career, Blake led the WCHA in goals with 19, and was named to the All-WCHA First Team. He was the 56th pick in the 2006 NHL entry draft, selected by the Nashville Predators. The Badgers had two Hobey Baker candidates last year, Blake Geoffrion and defenseman Brendan Smith, who has been playing for Detroit’s AHL affiliate the Grand Rapids Griffins. The road from college hockey to the NHL can be tough, and some never get the chance. Geoffrion’s goal reminded me that now is the season for March Madness- hockey, that is. Tournaments are happening this weekend to determine who will play towards the Frozen Four April 7-9 in the Twin Cities. Minnesota puts more effort into hockey than any other state with an abundance of media coverage in high-school to NHL hockey. What else is there to do in Minnesota besides playing hockey? Next to the Stanley Cup playoffs, this is the best time of the year to be a hockey fan. Both Michigan and Denver are tied in rank at No. 5, so I’ve got two chances to get to the Frozen Four. Since Red Berenson’s mighty Michigan Wolverines are one of my teams, notable players to look out for include Carl Hagelin who finished fourth in the CCHA scoring race (15-22-37. Rookie John Merrill became the first defensman to reach the 20-goal mark since, now NHL Kings defenseman, Jack Johnson in 2005-06. Goaltender Shawn Hunwick ranked first in the CCHA in goals-against average (1.95) and save percentage (.931). Michigan’s energetic season, inlcuding the “Big Chill in the Big House” has prepared the team for the big stage heading into the divisional tournaments. The Denver Pioneers have completely revamped this season losing many player to graduation or the NHL track. Despite being in the top-ten most of the season, the Pioneers have been under the radar. Expect the usual quiet analytical play by Denver. Denver’s top two scorers are sophomore Drew Shore and freshman Jason Zucker. George Gwozdecky can’t look at the year and expect to foretell the future. In previous years, the Pioneers have learned that once in the NCAA tournament, the regular season and conference tournaments mean nothing. Last year, the Pioneers won the MacNaughton Cup, stumbled a bit in the WCHA Final Five and lost in the first round of the NCAAs for third consecutive season as a No. 1 seed. Many fans don’t take the time to watch college hockey, but it’s exciting if you are a hockey fan to realize you are watching the next great NHL stars. The most exciting event is happening in my hometown, Ann Arbor. Just blocks away from my aunt’s house, crazy collegiate hockey fans will pour into Michigan Stadium for a legendary game. College football is done, so bring on the hockey! NCAA hockey has taken over the nation’s largest football arena. The Michigan Wolverines will host the Michigan State Spartans for” The Big Chill at the Big House,” an outdoor hockey game on Dec. 11 before a sold out crowd of 110,00. The two teams met previously on Oct. 6, 2001 at Spartan Stadium for what was called “The Cold War.” In a 3-3 tie, both teams hope to change the past. Michigan brings a veteran team that has been inconsistent this season (9-5-4, 8-3-1 CCHA), but is pushing for a tournament tour. The Wolverines have the most NCAA championships than any other collegiate hockey program. Coach Red Berenson anticipates a strong show for Michigan, expecting 80-85% maize and blue. Berenson, who played some World Championship games for the Canadian National Team as a teenager, coached two outdoor games with the Wolverines. Michigan and Wisconsin drew more than 55,000 hockey fans to Camp Randall Stadium in Madison, Wis., last February for an outdoor game. Rick Comley, Michigan State’s coach also grew up playing outdoor hockey. Michigan State hasn’t fared as well as their state rival (6-8-3, 3-7-1 CCHA). Michigan State goalie Drew Palmisano attended Ann Arbor Pioneer High, directly across the street from The Big House. He attended many Wolverine football games, and anticipates a memorable game and experience. Wonder if ex-MSU goaltender Ryan Miller will use his day off to watch the game? The Michigan hockey team will sport retro-inspired game jerseys designed by Adidas, to honor the “The Big Chill at the Big House.” The design is similar to Wolverine jerseys worn by the 1945-46, 1946-47 and 1947-48 teams with an image of a wolverine on the front and stripes on the shoulders. A fireworks display, will introduce the Wolverines as they take the ice, plus more fireworks with a Michigan goal. Post-game fireworks, will be choreographed to the music from the movie “The Big Chill.” Big Chill co-writer, director, and Michigan grad Lawrence Kasdan, will take part in the pre-game ceremonial puck drop. 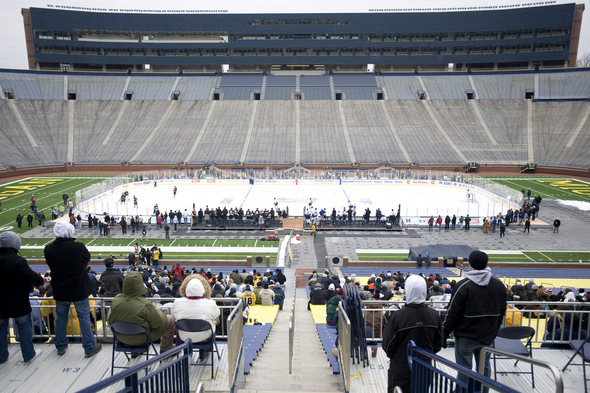 To help prepare the ice for Saturday’s big game, Michigan Stadium have scheduled hockey games, including high schools, youth leagues and a few alumni groups. A public skate will end the festivities on Dec. 12. Former MSU forward, Mike Modano will watch, as well as other former Michigan players Kevin Porter, Mike Knuble and the other Wolverine players now in the NHL. Catch the game on the Big Ten Network at 3 p.m.EST. Go Blue!